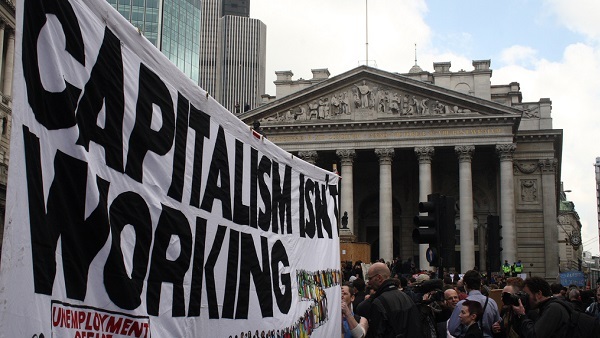 Anti-Capitalist protest at the G20 summit, London, 2009. “Twenty-five years after it was first published, American Psycho is now a canonical work of social satire, widely regarded by gender theorists and feminist critics [just the people we want teaching ethics] alike as a scabrous assessment of modern masculinity run amok. But if we have a choice, as Christianity and capitalism teach, then those same characters offer proof of the ancient Christian doctrine of original sin. Mises wrote on many occasions that freedom and the division of labor generate cooperation, peace and civilization. And Hayek wrote “Individualism: True and False,” that Christian individualism promoted respect for traditional morality.